I wish Big Al a speedy return to good health if he is under the weather. Agreed. Get well soon Al! NO…….my system dose not calculate breakout world events! My well wishes also. If under the weather, probably because he couldn’t cheer on his beloved Huskies in the March Madness………. Go Gonzaga! Both men and women teams in the Sweet 16 tomorrow and Saturday. Men against UCLA and the women versus Tennessee. The men should win and the ladies lose. Impossible to buy a ducat for either game but CBS TV will be covering them. I agree with Gary across the board today. I thought his analysis was very sound and it was a very well-rounded look at everything. Cory thanks for working hard when you should be relaxing on the beach. Gary I dont see any bullishness re gold…overall….sure a few are glad but great trepidation continues…no faith in it in any way..
Hey Matthew. I couldn’t see the blue circle on that chart, but may just be missing it. What is your upside target? I mentioned the dollar would have a 2-3 week counter-trend move when it topped, and this happened on the double top (11th/13th) in the dollar. This allowed PMs to have a nice counter-trend pop, and save the November low of 1130 to be tested later in the spring. If we bottom in the Dollar and top in Gold soon, then that would be right on schedule for the 2+ weeks. Yeah, we aren’t far from 25.85 in UUP, and I wouldn’t be surprised to see it go higher than that next week. Yeah, today is a wildcard, but I expect it to move up past 26 next week. It was NOT because the Saudis, but discover that the airliner accident was caused by a crazy pilot. How can you fly safely knowing who is encharge the plane? It was gold haven demand! That jet got blown up in flight. Look at the pieces of air craft on all sides of the mountains. There was no impact zone. It fell out of the sky like confetti. Look for your self. They are certainly lying about something. That jet got almost vaporized and literally fell out of the sky like confetti. Something really big happened they are covering up. No doubt about it! Imagine a jet crashing at 500 miles/hour in a rock… It will vaporized! And it won’t be scattered a mile wide either. More than 140K GLD shares trade BEFORE the open market!!! Cory, is Búzios, Rio de Janeiro? No. I’ve stayed at Geriba Beach in Buzios. Good beach on the peninsula, great weather but the town of Buzios is a bit run down….I was worried getting a bus in the dilapidated bus station. Maybe it’s rebuilt by now. Welcome to Brasil!!! My country. Great country, Love the steaks! I find the sea a bit on the cold side though. Go to churrascaria and eat a lot of picanha!!! A lot of great chicks, but not for you. You’re married now! Peter, CFS isn’t Cory but is our resident world traveler. That chart looks like a more dramatic Scorpio chart. Silver doesn’t have to do much from here for it to reverse sharply. I plan on holding it well past the 30 cent range. It’s like an “at the money” call option. Cool. It has been a $2+ stock before. I have always sold winners too soon so maybe this one I will hold on to. I brought up a ten year/monthly chart on SPM and it is at a ten year low, close to where it has been twice before and both times it went to $2. I can’t bring the chart up here. Wildcat Silver use to have very good leverage but no production. I recently picked some up. Both Shad and I have noticed a late day seller of SPM many days. Definitely not trying to profit at the daily highs anyway. Thanks Dan. Yes we have had some good posts on Scorpio Mining in the past. Matthew, it is definitely worth having a position in it, as they have good mines, properties, exploration upside, and know what they are doing. I made a fortune on them in 2010 & 2011, lost a fortune in 2012, and re-established a long term position in 2013. I have recently taken a bigger position when I got the news of the merger with US Silver and gold, but should have waited a little longer after announcing the merger, because it is normal to have fallout for the company that is doing the acquiring. This acquisition was a solid deal though, and good for both entities. The stock got hit hard when people could sell out after the conversion to Scorpio shares. Dan is absolutely correct that a large investor continued to slam the close down, wiping away the gains for the last 2 weeks, but I don’t expect that to continue much longer. This is a longer term hold for me though and I see a multi-bagger in this company. To me they are like the Silver version of Claude, where they have been overlooked, forgotten, and thrown out with the sector. Also, they own 9% of Scorpio Gold, who just paid off all their debt and will be cash flow positive by the end of this year. That is another sleeper, that will benefit the mother-ship Scorpio Silver. Dan & Matthew – I found the old post for Scorpio in case there is anything of value. Scorpio mining just acquired US Silver & Gold Inc in a merger to add another mine and more exploration targets to its portfolio. There are a ton of companies that are drastically oversold at present, and Scorpio is one of them. While it does mine quite a bit of Silver, a large percentage of it’s silver equivalent credits are from Lead, Zinc, and Copper. This can be a blessing or a curse depending on the base metals markets, but Scorpio is more solid than many copies, has an income stream from its mines, just enhanced its portfolio of assets, and has barely moved up with the rise of Silver lately. This year is likely when it will get re-rated and should at least double or triple in the next 12-18 months. Scorpio Mining is SMNPF in the OTC markets, and yes I just bought more when this merger was announced, because I like small producers with an income stream, with a diversity of assets for exploration upside, and that has been beaten down because it was thrown out with the rest of the sector. That is the same reason I like Claude Resources in the gold mining space. Good luck to all. Thanks for your response, Shad, There is more shares outstanding but not really any dilution because of the combined values work out quite well. Maybe they will consolidate this year sometime. I have noticed that someone bombs Scorpio at the end of most days. Volume has come down significantly as the sellers from the merger dry up. I own some. Yes, I have noticed that Dan, and think a great deal of what happened recently was people selling that were part of the merger with US Silver and Gold. It is fairly typical that the company taking over another suffers a little in share price when a merger is announced and implemented, but that is mostly over now and they have a lower share price with even a better asset base and picked up another mine. I do have a position in Scorpio (around $.19) that is just a little underwater since the merger. I was actually thinking of adding to that position just to average down a bit, because once the silver price recovers some they should be set up for a nice bounce. What has been helping them lately are their base metal credits. I like Scorpio and don’t think they’ve been properly valued and went down with the sector, but hey, almost everything in the silver mining space is way undervalued. Just look at Endeavour or Aurcana or Great Panther. Thanks Shad, I like Scorpio also and have owned them for 10 years off and on. I have seen them this low before and they have come back each time. I am in at about .21 so I may average down a bit too. I think the merger is a great deal for Scorpio and will be patient with this one. Agreed Dan. I have owned them since 2010 and it has been a wild ride, but they usually deliver close to the guidance, have improved things every year, have lowered their costs, and with the merger now have more stability. I could also see them getting taken out by a larger Gold, Silver, or even Base Metals producer at one point down the road. I re-posted the Scorpio threads from the past in here for you, so it could be grouped with this thread with you and Dan. I’ve now nearly tripled my position this quarter in Impact Silver. It’s a tiny producer but I own it for its exploration blue sky, which is immense, in my opinion. I don’t think many understand it’s potential or the fact that less than roughly one-fifth of one percent of the property has been drilled. Of course it should probably NOT be considered for investment right now by anyone who doesn’t see at least modestly higher silver prices soon. Hey Brian – Yes, I am with you on stomach churning in many of the silver stocks. I have been waiting to establish a position in Alexco as well, but am not sure if the March 10 low is the intermediate low, or if it could go just a wee bit lower in May. It has rebounded nicely from there for the last 2 weeks. Honestly, most silver Jr stocks are still far oversold and have charts that look just like Alexco & Scorpio (like Aurcana, Santacruz Silver, Silvercrest, etc…). It is interesting to the note that the Mid Tier Silver producers actually rallied the last week or two, where the Jrs didn’t really get as much of a bid. My favorite Mid-Tier is still Hecla, but I also really like Endeavour Silver, and Fortuna Silver. The chart for Fortuna actually looks similar to the Alexco chart. Hey Matthew. Thanks for the heads up on Impact Silver. I have heard of them in the past but wasn’t following them. I am going to do a little more research on their production and exploration upside. I like that under 1% of the property has been drilled because there could be a few surprises still in store. However, I have seen where with Aurcana’s Shaftner mine in TX,that they didn’t have it drilled out enough, only to realize they didn’t have the grade continuity that was hoped for. As a result, they had to put the new mine on care and maintenance as the Silver price dropped because it wasn’t as robust as once imagined. It’s a two-way street with unexplored lands, but definitely something to keep an eye on. While we are talking speculative exploration plays in Jr Silver, I have just recently starting watching what is going on with Bear Creek Mining (BCEKF). It has gotten the snot kicked out of it, but I watched some interviews from Catherine McLeod-Seltzer (their chairman) at the BMO show just a month or so back, and it caught my attention. Shad, the great thing about IPT, when compared to Aurcana, is that it has no debt, a tighter share structure, and their huge property is loaded with old mine workings from centuries ago —over 4,000 of them so far, and 42 old mills. The tailings, or waste rock, that was tested turned out to be high grade ore by today’s standards. Apparently, 500 gpt was considered low grade in the 1500s. Since the property (The Royal Mines of Zacualpan) belonged to the Mexican government before Impact acquired it, it has never been tested using modern techniques. It’s an exciting property in my book. Btw, the property is 623 square kilometers (240 square miles). Thanks Matthew and Shad. Aurcana is crap and Impact is good IMHO. Aurcana may have changed but I group it with the rest of the pump and dumps. Yes, I agree that Aurcana has made some terrible decisions that have cost them dearly. They didn’t properly drill out the Shafter property, so after all the work to recommission and open the mine, they had to put it on care and maintenance after just 3 months when the silver price tanked. Then in the middle of all that, they ran into problems financially and did a reverse stock split at the worst possible time. That is when I got out and about when Big Al canceled them as sponsors on this site. I am still watching them though, because if silver prices rebound, then they may be able to get their act together. However, there are much better silver companies to look at. Hecla, Endeavour, Fortuna, Great Panther, Alexco, Silvercrest, Scorpio, Santacruz, McEwen (lots of silver), and of course Silver Wheaton. Matthew, I’ll check out Impact Silver as well and add it to the watchlist with Dan’s suggestion of Wildcat Silver, and I’ve recently added Bear Creek Mining on due to their Corani Silver/Gold/Base Metal project that they are finishing the Feasibility Study on soon, and then go to financing, with production of mine slated for late 2016. I think Bear Creek will be a good turn-around story. On a different note I saw that Palladium broke a key support area today and that has me concerned and I really lightened up on my exposure to this space over the last 2 days. It was making higher lows and hadn’t breached the $751 low from Oct 17th…..until today that is. Since I expect PMs to be under some pressure next week and the dollar to rally a bit, then I on the sidelines until then. I’m ready to make a quick decision though if something changes, but Palladium looks like it is teetering on the fence. 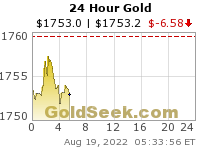 That makes for five days in a row that I have been right for my predictions for gold including another one on options expiry……..so going forward………looking at my screen for tomorrow’s prediction………………………………………..GOLD WILL RISE AND SHINE AGAIN to close out the week tomorrow for FRIDAY MARCH 27, 2015. I saw that, and yes it was an excellent interview! That was a fantastic interview with Alasdair Macleod – longer than I was expecting, but very thorough. The beginning part on the AIIB and how that will affect the US dollar, European relations with China and Asia, and how the long term currency reshuffling will affect the status of the dollar was very interesting. I think his views on Gold, the Petro-Dollar, the European Bond Market, and the currency wars were spot on. We’re all starting to love you Mark!! Speaking of which Al where’s that other optimist Roger Wiegand? He appears only to disappear! A…I, too, was hoping Roger would show up , to help AL. Good question Rev. His comments are all over the board, but I still like hearing what Roger has to say, and in particular his thoughts on the commodity marketplace. Couple of things I want to comment on! 1. All get better 🙂 We love ya! I agree Glen. Gary had a very level-headed and rational overview of the markets today. Good stuff. Do you have some specials powers we don’t know about or are you talking to us underneath a desk at the federal reserve head quarters? Which one is it pal? You are scary right lately. I KNOW…..ME TOO……………this system that I have worked out is kind of scaring me! correction i meant special not specials. Specials is what mark is giving us lol. Gold hit $1220 today. That has been an important number since 2009 )(2009 top was around $1224 if I recall correctly). There was resistance in gold at 1220 today and it will be interesting if it pulls back from here or not. The miners are indicating I’m probably going to be correct about gold taking a breather. I agree Gary. It’s interesting action and telling of trader sentiments where there is a sell-off taking place in miners in anticipation of further gold price declines next week. Gold is weakening and miners are predictive of that. We are still dropping today and could close below 1200 on a weekly basis. Bad news for the bulls if that should happen. I am loving your call on oil by the way. Good trade so far. I finally read the article you posted last night on quicksilver markets.I printed it last night and read it today.That article right there is why I follow the KER.To be honest I didn’t expect such a candid and honest article.I don’t always agree with you,but I do appreciate your posts. Many thanks John. You will surely be in a minority on this site who appreciate any of the posts I leave because most of the bugs here absolutely hate me (in case you had not noticed!). Have a look at my remarks on Chris’s thread that I left today and tell me what you think. I see a reversal of magnitude coming in the dollar that is quite significant and has not been seen since 2001. That trend change incidentally, warns us that US inflation will without a doubt be on the rise in America but also that the end of gold’s declines could be but a few months distant. Your comments on that would be most welcome. Hey does anyone know why Gold Canyon Resources Inc popped %27 today on no news? Glad I bought that last month. I jumped over to the bear side of things today in JDST and RUSS. Bag holder on NUGT. Will have to average down. That is likely going to be a good move. Personally I was only anticipating about a 2-3 week counter-trend move in dollar down and PMs & commodities up. By next week I would think PMs would be coming under pressure again, and the dollar will start climbing higher. The Irish Paddy-Wac Gold Star Award…To “MARK” , for his outstanding calls on gold this week….Should he finish out the week with correct calls then his award will be upgraded to Platinum……A big round of applause for Mark…Thank You. But cause and hui both went down! collecting all their premiums…(this is quoted…). Mark are you a bullion banker……???? Silver looks quite a bit better than gold right now. To me, this is further evidence that both are going higher. A little consolidation here, first, would be good. Is the MACD really showing that silver is NOT YET overbought? Surprising after someday consecutive up days. oops … meant RSI, not MACD. That’s right and notice that it first became oversold at about 19 last yet still went to 14 and change. The same thing can happen in the other direction when the RSI hits 70. 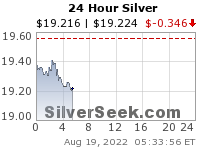 If silver is 18 or 19 when it gets there, we might still see another 4 or 5 dollars of upside. Good thoughts on the Silver RSI Brian & Matthew. I just don’t see the potential for serious downside right now. Looks like its time to get into DUST and JDUST. What would be your targets? I’m not sure gold will drop below $US 1180, so maybe a +10% move in JDUST?